Washington state has the highest location quotient (concentration) of planners in the country, according to the federal Bureau of Labor Statistics (BLS). This is measured by the ratio of planners to all jobs in the state and compared to the same ratio nationwide. About half of the 2,510 planners here are members of the state chapter of the American Planning Association. And it pays well here too, with a median annual wage of $73,400. Much of this is attributable to the manpower local governments need to regulate the state’s extensive development and environmental laws, especially the landmark Growth Management Act (GMA) and State Environmental Policy Act (SEPA). The state also weathered the economic recession fairly well and the Puget Sound real estate market is booming, which requires departments to bring on more staff for reviewing building permits, subdivision plans, and zoning changes. 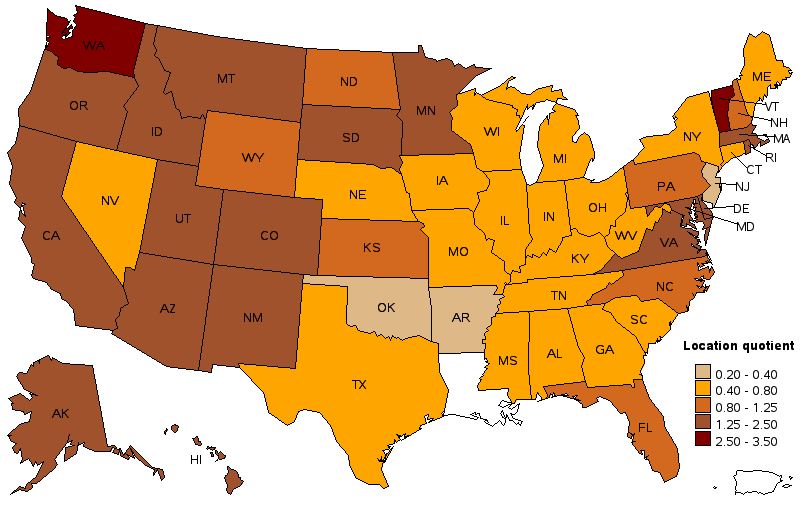 The other top five states are, in order, Vermont, Alaska, Oregon, and Hawaii. Oregon, at least, is not surprising since it pioneered the concept of growth management in the 1970s. The other top states are small or have relatively small populations, so perhaps planners there are engaged more in natural resource management and environmental planning. The top paying state is Nevada, with an annual median wage of $82,400. Someone has to plan for Las Vegas’s inevitable doom, after all. The next top paying states, all near the $80,000 mark, are California, Connecticut, Alaska, and Oregon. When concentration is broken down by metropolitan areas, Washington claims four of the top ten spots. Number one is Olympia, the state capital. Again, this isn’t too surprising if its explained by the state government employing many planners to oversee the GMA. But interestingly (or alarmingly), Kitsap County ranks third in the entire country. This is where I work. The peninsula is not exactly a bustling urban center and my department is actually understaffed, which makes me wonder what Bainbridge Island and Poulsbo are up to. Mid-sized Bellingham takes the eighth spot and the Seattle metro, finally, is at number ten. Three California metros also make the list. Also in California are six of the top paying metro areas: San Francisco, San Jose, Santa Rosa, Napa, Santa Barbara, and Redding. The top ten is rounded out by: Boulder, CO; Las Vegas; College Station, TX; and Bend, OR. If you’re more of a rural dweller, the BLS has data for you too. Among “nonmetropolitan” areas, northwestern Washington (Olympic Peninsula and the San Juan Islands) have the highest concentration of planners. The next four are: southeast Alaska (which is also the highest paying, with a median salary of $80,670); north-central Colorado; southwestern Montana; and the north coast of California. It appears that, for the most part, there are more planning jobs and better paying positions in the western part of the country. This coincides with the amount of growth that states like California and metro areas like Seattle are experiencing. If you’re newly graduated or looking for a career change, you might start by looking in these areas. To explore all of the data, visit the BLS page on urban planners.